Get some historical perspective at The Rocks and Justice & Police Museum. You'll visit kid-friendly attractions like Bondi Beach and Sea Life Sydney Aquarium. And it doesn't end there: see a show at Sydney Opera House, admire the natural beauty at Royal Botanic Garden Sydney, make a trip to Macquarie Lighthouse, and take a tour by water with Boat Tours & Water Sports. For more things to do, where to stay, maps, and more tourist information, read our Sydney trip planner . If you are flying in from France, the closest major airport is Sydney Kingsford Smith International Airport. 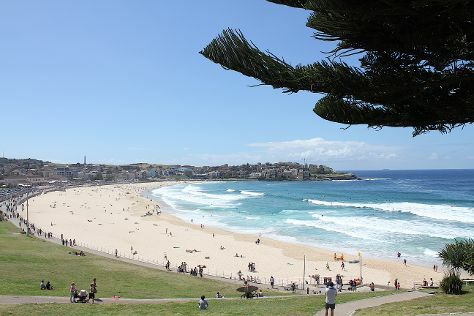 In July in Sydney, expect temperatures between 21°C during the day and 9°C at night. Wrap up your sightseeing on the 14th (Tue) early enough to travel to Brisbane. Start off your visit on the 15th (Wed): contemplate in the serene atmosphere at Old St Stephen's Catholic Church (Pugin Chapel), then kick back and relax at Moffat Beach, then look for all kinds of wild species at Lone Pine Koala Sanctuary, and finally contemplate in the serene atmosphere at Nepalese Pagoda. Here are some ideas for day two: kick back and relax at Dicky Beach, take in the spiritual surroundings of St Mary's Anglican Church Kangaroo Point, and then take a stroll through Wynnum Esplanade. To find other places to visit, ratings, where to stay, and tourist information, go to the Brisbane trip itinerary maker website . Fly from Sydney to Brisbane in 4 hours. Alternatively, you can do a combination of flight and bus; or drive. In July, daily temperatures in Brisbane can reach 24°C, while at night they dip to 11°C. Finish up your sightseeing early on the 16th (Thu) so you can go by car to Bribie Island. On the 17th (Fri), view the masterpieces at Bribie Island Community Arts Centre, then see the interesting displays at Bribie Island Seaside Museum, and then enjoy the sand and surf at Bongaree Beach. On the 18th (Sat), you'll have a packed day of sightseeing: explore the world behind art at Abbey Museum of Art and Archaeology, then tour the pleasant surroundings at Red Beach, and then kick back and relax at Woorim Beach. For where to stay, photos, more things to do, and tourist information, read our Bribie Island attractions planner . You can drive from Brisbane to Bribie Island in 1.5 hours. July in Bribie Island sees daily highs of 24°C and lows of 11°C at night. Wrap up your sightseeing on the 18th (Sat) to allow time to travel to Woodford. Woodford is a small town in Queensland, Australia, on the D'Aguilar Highway 72 km north-west of Brisbane and 24 km west of Caboolture. On the 19th (Sun), appreciate the history behind Woodford Leopard Tank and then take your sightseeing to a higher altitude at Glass House Mountains National Park. To see traveler tips, where to stay, maps, and tourist information, read Woodford travel planner . Getting from Bribie Island to Woodford by car takes about 1.5 hours. Expect a daytime high around 24°C in July, and nighttime lows around 11°C. Wrap up your sightseeing on the 19th (Sun) to allow time to travel to North Stradbroke Island. Kick off your visit on the 20th (Mon): explore the different monuments and memorials at Dunwich Cemetery, identify plant and animal life at Myora Springs Conservation Area, then enjoy the sand and surf at Frenchman's Beach, then get great views at North Gorge Walk, and finally kick back and relax at Cylinder Beach. Here are some ideas for day two: explore the striking landscape of Blue Lake National Park. To see ratings, where to stay, traveler tips, and tourist information, you can read our North Stradbroke Island day trip site . Traveling by car from Woodford to North Stradbroke Island takes 4 hours. In July, plan for daily highs up to 24°C, and evening lows to 11°C. Finish your sightseeing early on the 21st (Tue) to allow enough time to travel to Hermannsburg. On the 22nd (Wed), get engrossed in the history at Hermannsburg Historic Precinct. For ratings, reviews, maps, and tourist information, read Hermannsburg tour itinerary app . Use the Route module to find suitable travel options from North Stradbroke Island to Hermannsburg. Wrap up your sightseeing by early afternoon on the 22nd (Wed) to allow enough time to travel to West MacDonnell National Park. Start off your visit on the 23rd (Thu): explore the striking landscape of Ormiston Gorge. On the 24th (Fri), you'll have a packed day of sightseeing: look for all kinds of wild species at Glen Helen Gorge and then take in the awesome beauty at West MacDonnell National Park. For ratings, traveler tips, other places to visit, and more tourist information, you can read our West MacDonnell National Park online sightseeing planner . Use the Route module to find suitable travel options from Hermannsburg to West MacDonnell National Park. Finish your sightseeing early on the 24th (Fri) so you can travel to Alice Springs. Kick off your visit on the 25th (Sat): steep yourself in history at Alice Springs Telegraph Station Historical Reserve, then pause for some photo ops at John McDouall Stuart, then identify plant and animal life at Alice Springs Reptile Centre, and finally identify plant and animal life at Alice Springs Desert Park. 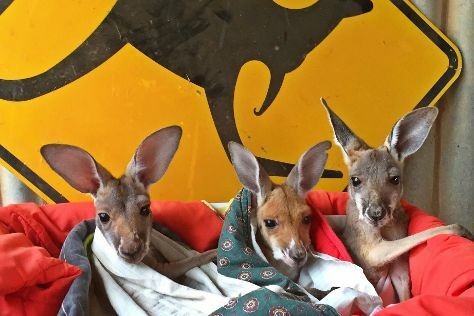 Get ready for a full day of sightseeing on the next day: get great views at Anzac Hill and then identify plant and animal life at The Kangaroo Sanctuary. For maps, other places to visit, and more tourist information, read our Alice Springs journey planner. Explore your travel options from West MacDonnell National Park to Alice Springs with the Route module. Expect a daytime high around 24°C in July, and nighttime lows around 3°C. Wrap up your sightseeing by early afternoon on the 26th (Sun) to allow enough time to travel to Cairns. On the 27th (Mon), identify plant and animal life at Hartley's Crocodile Adventures, then take in the architecture and atmosphere at St Monica's Cathedral, and then explore the different monuments and memorials at McLeod Street Pioneer Cemetery. Keep things going the next day: get a dose of the wild on a nature and wildlife tour. To see more things to do, other places to visit, photos, and tourist information, refer to the Cairns trip itinerary planner . Getting from Alice Springs to Cairns by flight takes about 4.5 hours. Other options: drive; or take a bus. Expect a bit warmer weather when traveling from Alice Springs in July: highs in Cairns hover around 30°C, while lows dip to 20°C. Wrap up your sightseeing by early afternoon on the 29th (Wed) to allow time for the car ride to Atherton. Atherton is a town and locality on the Atherton Tablelands within the Tablelands Region, Far North Queensland, Australia. Start off your visit on the 29th (Wed): look for all kinds of wild species at Atherton Tableland. On the 30th (Thu), you'll have a packed day of sightseeing: get advice or help at The Bat Hospital Visitor Centre, contemplate the long history of Historic Village Herberton, then view the masterpieces at Rainforest Gems Gallery & Studio, and finally identify plant and animal life at Granite Gorge Nature Park. To see photos, maps, traveler tips, and tourist information, use the Atherton online road trip planner . Traveling by car from Cairns to Atherton takes 1.5 hours. In July in Atherton, expect temperatures between 30°C during the day and 20°C at night. Finish up your sightseeing early on the 1st (Sat) so you can travel to Fraser Island. On the next day, delve into the lush surroundings at Central Station Rainforest and then contemplate the waterfront views at Lake McKenzie. 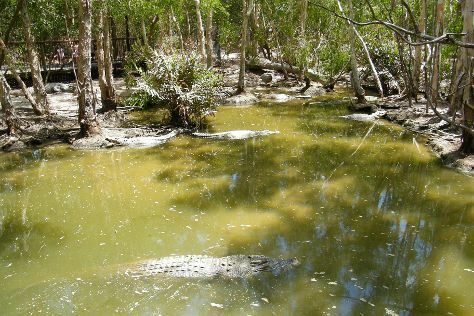 For more things to do, ratings, maps, and more tourist information, read our Fraser Island tour itinerary planner . Use the Route module to find suitable travel options from Atherton to Fraser Island. 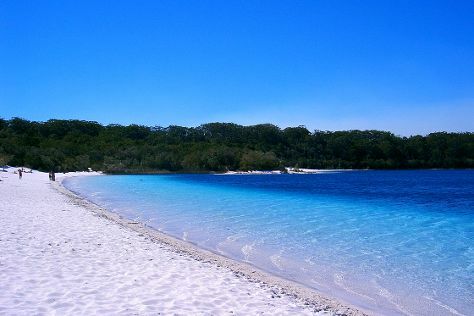 Traveling from Atherton in August, expect Fraser Island to be slightly colder, temps between 27°C and 13°C. On the 4th (Tue), you're off tohome.